For the kind of people who will pay potentially $2,399 for a new laptop, it’s probably best if I cut straight to the specs. The beefier 15-inch model is now a six-core machine, with Intel Core i7 and i9 processor options, up to 4TB of storage and up to 32GB of DDR4 memory. With the 13-inch model, you have a choice of Core i5 and i7 chips, including quad-core CPUs on the Touch Bar models. For the 13-inch, you’re maxing out at a two-terabyte SSD, up from one terabyte in the previous generation. As for graphics, the 15-inch model is once again the better performer, with AMD Radeon Pro GPUs and at least 4GB of VRAM. The 13-inch model has integrated Intel’s Iris Plus 655 graphics, 128MB of eDRAM. 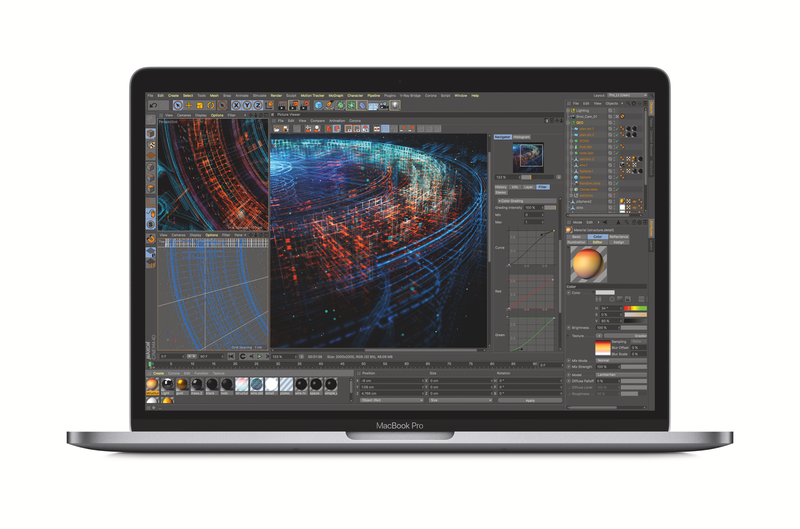 If neither graphics solution is enough, Apple will also be selling an external GPU in its store for the first time, a $699 model from Blackmagic that feature AMD Radeon Pro 580 graphics, 8GB of GDDR5 memory, quiet 18db performance and a slew of ports that includes two Thunderbolt 3 sockets, four USB 3.0 connections and one HDMI 2.0 output. It also delivers 85W of power, allowing you to power the laptop and drive an external display. Regardless of the screen size, both MacBook Pros pack larger batteries to help offset those power-hungry processors inside. As of this writing, Apple has not supplied battery life estimates for either the 13- or 15-inch model. As you might expect, this will be among the first things we test when we receive our review unit in the coming days. Some other similarities: Both models now use the same so-called True Tone technology already found on the iPad Pro. That means there’s an ambient light sensor inside telling the machine to adjust the screen’s color temperature depending on where you’re sitting. The Touch Bar is also now True Tone, which is a nice touch. Additionally. both models pack Apple’s custom T2 security chip, which was first introduced on the iMac Pro and oversees a number of the system’s components, including the system management controller. Also, the fact that the T2 is an always-on chip means that the new MacBook Pros can respond to a hands-free “Hey Siri” command. That might be the more important point for mainstream users who don’t know or care how their system is secured. As for the keyboard, it’s supposedly quieter. Though I had a few minutes to play with it in my demo this week, I’m not ready to pass any sort of judgment. For one thing, I never thought the MacBook Pro keyboard was that loud to begin with, and when I had a chance to try it this week there was no opportunity to do a side-by-side test. It does appear, based on everything Apple has said, that the stability and precision of the keys remain unchanged. That’s actually an area where I would have liked to see more tweaking — I made typos on the last-gen MacBook Pro and I made a few in my brief hands-on this week. Again, though, I’d rather reserve judgment until I can spend more time with the new MBP and also compare it to the older model I have lying around. Trumpet player Spencer Ludwig produces his music in Logic X Pro on a MacBook Pro during a media briefing on Tuesday. All told, this is at least the third time within the past year that Apple has seemingly taken pains to prove it hasn’t forgotten about its more demanding customers. There was the iMac Pro launch back in the fall, where Apple gathered a group of app developers before reporters, to show how they were using Apple’s latest professional-grade desktop. Then there was Apple’s education-themed iPad event this spring, where teachers took the stage, seemingly to address other teachers who hadn’t yet decided if they wanted an Apple- or Google-powered classroom. This time, for the new MacBook Pros, Apple introduced reporters to a pre-selected group of creators — photographers, musicians, coders — who had been using the new laptops. It’s impossible for me to corroborate what they’re saying; we might never know how slow and convoluted their workflow was before they had access to a laptop with a Core i9 processor or 4TB SSD. And it doesn’t help for me to say that their code debugging, their video rendering, their music production, all looked fluid in the demos I saw. What matters more is that Apple is listening to these customers, or is at least giving them proper lip service.